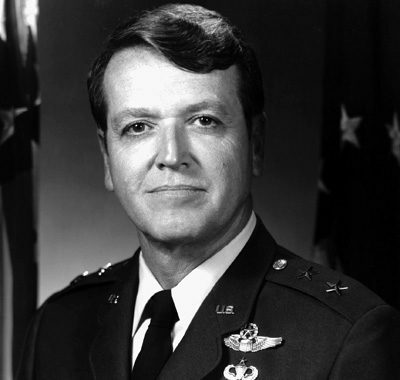 Major General William A. Gorton US Air Force (Ret) (1933- ) was born in Providence in 1933. He entered the Air Force as an aviation cadet in February 1954, and earned his wings and commission in June 1955. He flew F-100 Super Sabre fighters in France and Germany in the late 1950s. 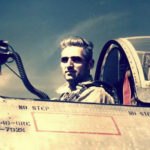 He returned to George Air Force Base, CA as an F-104 flight commander in October 1961. In August 1965 he went to Vietnam where he flew 171 combat missions as a forward air controller. On his return he completed a number of staff assignments and earned his BA from the University of Nebraska in 1968. While attending Air Command and Staff College at Maxwell AFB he also earned an MA from Auburn in 1969. He took command of the 602nd Tactical Air Control Wing at Bergstrom Air Force Base, Texas, in June 1976. In August 1977 he was named deputy assistant chief of staff, operations, at Tactical Air Command headquarters. He held this position until August 1978 when he became commander of the 31st Tactical Fighter Wing, Homestead Air Force Base, FL General Gorton is a command pilot with more than 4,500 flying hours. He has flown every fighter from the F86 through the F-16. His military decorations and awards include the Distinguished Service Medal, Legion of Merit with oak leaf cluster, Distinguished Flying Cross with oak leaf cluster, Bronze Star Medal, and the Air Medal with four oak leaf clusters. His last assignment was commander of 16th Air Force, headquartered at Torrejon Air Base, Spain, with responsibility for U.S. Air Forces located in Spain, Italy, Greece and Turkey. He was promoted to major general Oct. 1, 1982, and retired 1 October 1, 1985. He now lives in St. George, Utah.